And the reviews don't stop! Today I'll be looking at a personal favourite and much anticipated figure of mine. 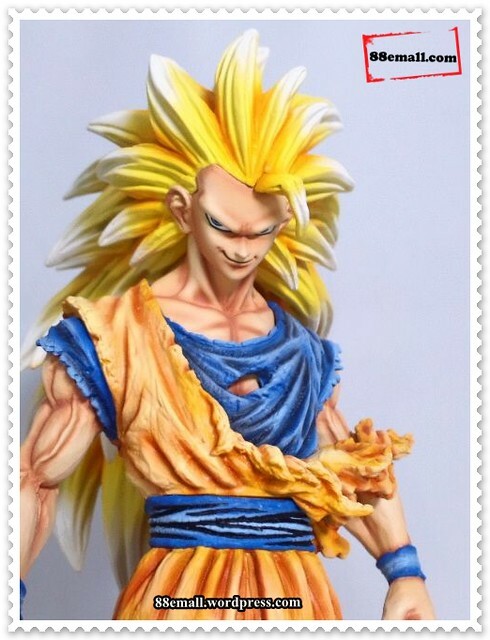 The freshly released SCultures SSJ3 (Super Saiya-jin 3) Son Gokou made by Banpresto. "Master Stars Piece, alongside the Special Quality figure series, is one of the series produced by Banpresto to go along their strategy of making very high quality figures, going over the market segment occupied by Megahouse with its Portrait of Pirates series. It involves male characters from successful Japanese franchises like Dragon Ball, Naruto or One Piece." The first figures of the line were unveiled during the Jump Festa'11 event, held on December 18-19 2010. And the focus was indeed put on the sculptors with the launch of a promotional operation in the form of a tournament where sculptors could compete to get the maximum amount of public votes via a dedicated site, the Zōkei Tenkaichi Budōkai. This way, between January and May 2011, the public could choose the best Dragon Ball model (zōkei 造型 in Japanese) between a selection of 10 prototypes. The winner got his model produced as part of the Master Stars Piece line and received the grand prize of one million yen. Upon it's conception, I myself was blown away by the SSJ3 model when I first saw prototype images on the site sculpted by Keji Iwakura. I documented the tournaments progress lobbied predictions and shared my enthusiasm with other users on the Dragon Ball based website "Daizex (Daizenshuu EX)". You can find my documentation of the tournament and opinions lobbied here, and here. The SSJ3 Goku model was pitted in the "B block" and was squared off against the Piccolo model. In the beginning the SSJ3 had the upper hand, but soon the Piccolo slaughtered the SSJ3 in a landslide amount of votes, these votes propelled Piccolo to the top spot where he never looked back after that. Near the end of the competition (which was to end January 31st, 2011) the SSJ3 was selected under the "???" designation. This was a wild card slot that thrust him back into the voting for the tournament finals. He was slated to add competition to the now far ahead Piccolo, sadly it was to no avail as the Piccolo continued on his upward ascension towards the coveted title of Master Stars Piece. Voters voted furiously and meant business, they really wanted the Piccolo to win it seems. For the Second Zoukei tournament which focuses on just 6 figures from Dragonball and the first One Piece Zoukei tournament voting was limited to only residents of Japan. One had to enter a Japanese based email into a prompt before being able to vote. This style varies from the first tournament in that the first tournament was open to the entire world for voting, whereas subsequent tournaments are specifically locked into voting within Japan only. This was what the site looked like, and this was the tournament table set up. Here you can see the various sculptors and their group placements. The voting button was located above the green scouter, which would bring the user to a small screen where they could select which sculpt they wanted to vote for. (Upon selection, whichever sculptor got voted for had a nice little glow flash animation sequence). The user could also click the scouter to view the current view counts. Votes were limited to once a day but one person could vote for the same figure multiple times. In the sculptor profile a user could also view the sculptors sculpted figure as it progressed through the prototype stages, and also a little biography on the sculptor under the "profile" tab. Upon clicking the "product" tab the user was subsequently brought to a page where they could view the figure on a 360 degree rotational angle as well as additional images of the figure in production as they appeared to the right side. Now that we've run over a bit of the figure's origins let's move on to the review of the Banpresto SCultures SSJ3 Son Gokou! As I mentioned at the start of this review I was very excited upon the inception of this figure. The very thought that we'd be getting a DX scaled and good sized SSJ3 Goku figure excited. Especially because no decent sized SSJ3 Goku figure had been made before this. I will make it clear right now that I do not consider the "Max Muscle Mania" Goku to be a decent figure representation of SSJ3 Goku, especially with the recent amazing production of the SSJ3 SCultures version." But here with this figure Banpresto has given us a stunning representation of Goku in his Super Saiyan 3 form. From top to bottom this figure is wonderful. In this review I'll go over the box, paint, sculpt, pose (which has limitations), packaging, base and overall thoughts of the figure. So let's get to it. The box is great. All boxes from this set of releases (barring the Ichiban Kuji prizes [SSJ Goku/Max Power Freeza]) are the same size and have the same graphics in the background. The background consists of the Tenkaichi Budoukai stage with a glowing orange/yellow sky above casting an orange glow upon the entire scene. The graphics look good on the side profiles as well. The top, back and bottom are standard graphics including the necessary information on each face (which I will cover). I really like the box overall though, the colours, size and overall presentation are compact and very well made. The box is a bit wide, but other than that it gets it's job done. On the Box Front. The box front is great, a nice large graphic of the figure is on the front face and center. You can see the SCultures logo to the top left, with the Banpresto logo to the top right. The "Banpresto Figure Colosseum" logo is on the lower left above the title name of the figure. The top of the box is standard with a silhouette of the Graphics of the Zoukei Tenkaichi Budoukai in the background (mirroring the front of the box). The title says "Banpresto Figure Colosseum" and features kanji in the middle, with "Dragon Ball Figure" in english underneath. The toei sticker is present to the lower right corner. To the left of the box we can see the title of the figure featured vertically along the side in the background. In the forefront is the figure itself. Here we see a full shot of him and he looks great. This is an extension of the shot featured on the front face of the box. Now all the boxes are standard in the presentation of images on the surfaces. The only differences will be in the figure names and corresponding graphics and information tied in with it. Anyway focusing on the back of the box to the right you can see a repeat of the logo featured on the front face (the Banpresto figure Colosseum "dragon ball figure" logo). Underneath that there is a photo of the sculptor that created the figure, along with a couple small paragraphs of kanji which I would imagine would depict the sculptors take on the figure and the tournament. Towards the center you can see another full view shot of the figure only re-sized to fit the box back. More Kanji is featured to this left of this figure shot which I interpret to be outlining the list of figures featured to the left of the box. The bottom half of the box features the figure name, lists the Zoukei Tenkaichi Budoukai staff, the website (z-tenkaichi.bpn...) and the standard safety warnings underneath etc. The right profile of the box has similar art to the left side, only the figure is shown from the right size in a full view, with a faded headshot silhouette of the figures face to the upper right corner. It's a very nice view in total, featuring the Super Saiyan3 Son Gokou figure title near the top. The bottom of the box is standard featuring the same silhouette as the top and then a small advertisement for the two current figure tournaments that are currently on-going. The Banpresto figure Colosseum 2 and the One Piece Banpresto Figure Colosseum. Each tournament icon has it's corresponding website underneath. The packaging differs from the "V" shaped packaging introduced in the first set. This packaging features a square cardboard shell with plastic wrap encasing the two main halves of the figure. The additional torn piece of cloth, support piece, and base are in plastic wrap with the base in bubble wrap inside plastic wrap. All in all the figure is packaged very nicely and snugly. The package also features a small promo card featuring the next in the line up to be rolled out (Android no.16 and Piccolo). The Ichiban Kuji prizes of SSJ Goku and Freeza were not on the card because they were released separately and are already out. To the bottom right you can see the companion piece "Cell". The sculpt.... Oh boy the sculpt THE SCULPT. WOW. I cannot even express how much I like the sculpt, the detail is unreal. The hair is the shining stand point of the figure clearly. But it has other strong points as well, I'll come back to the hair last. Firstly looking at the boots, the boots look phenomenal. They look rigid and worn almost scuffed and dirty with patches shaded darker to indicate dirt build up. It almost looks like there are scratches and/or burns on the boots (obviously battle damage accumulated form dodging numerous ki blasts :P). Case in point the attention to detail is wonderful. The boots are sculpted accurately and proportionately with the inclusion of his "rope laces" tied around the middle. Moving upwards to the legs we can see that the fabric features an abundant amount of ridges and creases where his pants tuck into his boots, as well as stitching/seam lines all along the inside and outside of his thighs. On the surface of his thighs in particular there are patches of missing fabric that seem to have been singed on the right leg, and torn off on the left leg. On the left thigh the fabric is also torn and splayed in a way as to make it look like the fabric is hanging loosely fluttering from a passing breeze. Onwards to the torso. The sculpt is wonderful here as well. His pectoral muscles are raised and rigid along with his neck muscles looking muscular and firm. The fabric on his shirt seems to be burnt/singed as well as torn. The orange gi has been torn all along the left side exposing his blue undershirt. This is where the separate piece of fabric comes into play. It has a small indent where a piece of the fabric can be inserted so that the fabric sits on his left arm to simulate his short being torn off. In order to get the piece of fabric on you need to flip it upside down and then loop the hole around the arm, then fit the protruding piece into the corresponding slot. I would have preferred if this piece wasn’t detachable but again it doesn't take away from the figure. You can also display it without this piece if you wish. The face is sculpted wonderfully with a nice arrogant smirk on his face with a look that portrays a mix of grim determination and delighted anticipation for the fight. He has no eyebrows which stays true to the design, and his eyes although hard to see when looking straight at him are blue dark blue with pupils which is also true to the design. And now moving on to what I feel is the striking point of this figure, THE HAIR! The hair is sculpted phenomenally; it is large, heavy and wonderfully detailed. From the small detail of his singular hair bang protruding from the front to the multitude of spikes extending out towards his back. The hair is incredible! I really like looking at the figure from different angles because the different contours of the hair provide shading within the hair itself. Looking at the hair straight on it extends out to the right and then to the left near the tips. Multiple layers of hair extend outwards and down. I really like the detail in the hair, it is excellent. Looking at this figure it doesn't feel like a 1,500 yen prize figure! The hair is incredible. The paint job varies from good to rough in some parts on the figure. I feel overall it's good and bad at the same time. Luckily this doesn't detract, but actually works for the figure itself in a way. Although the paint on the hair is excellent it’s going to lose some points and here's why. First the hair is not as golden or vibrant as prototype images would have lead one to believe. Even the box art boasts a brighter coloured hair pallet than the actual figure itself. I was expecting the hair to be a more vibrant golden yellow. Not shiny or pearly paint because that would have looked too "plastic" (as seen with the SSJ3 Gotenks HQDX figure); but just a slightly brighter and richer tone of deep yellow. The tone of yellow presented on the box is exactly the tone of yellow that I wanted to see appear on the figure. Sadly this is not the case. Looking at the paint job on the hair closely, one can see that the hair is actually a dull dirty brown with various streaks of a pale pastel yellow brushed on throughout the different strands all the way through. While this is fine in terms of overall appeal and effect, I would have preferred a more uniform paint in a solid golden yellow. The paint job is good though, on the hair especially (with a realistic dirty blonde tinge to it). Moving on to the skin paint... again it's good BUT the paint is a bit uneven, so it seems like some of the gray from the prototype is peaking through, This is apparent in very small areas like his forehead, pectoral muscles on his chest and slightly on his forearms and hands. Again this feels like something that could have been covered with a bit more paint application attention focused on specific areas. It doesn't detract from the figure as a whole but for me it's an issue to say the least. One glaring mishap was that the paint is very sloppy on his wristbands and at the borders between where his wristbands meet his forearms and hands. You can see some paint applications on the wristbands where the skin tone coloured paint was used too much. The paint job is also rough on his clothing. In a way this works because he is battle damaged, so the rough/messy paint job works towards completing his battle damaged look. He looks rough and rugged like he really just came out of a battle. (That could also account for the duller tone of his hair). This is what I meant by the paint job is "good yet bad at the same time". On his boots the paint is great though, very realistic and properly applied. Overall I just feel it could have used a bit of a sharper paint job, but other than that it gets the job done nicely. The base is very nice. Again it is the standard base that comes with all other SCultures figures (except custom ones like Driving School Son Gokou and the Ichiban Kuji prizes). The base is tinted and boasts the Banpresto Figure Colosseum symbol and kanji lettering etched into the base. It has a hole, and a support stick for the hair, since it is so heavy. Now, the figure CAN stand without the support stick, but it will lean over time (as evidenced in pictures below). It's best to just display him with the support stick. Now when placing his hair onto the support stick be sure to use the piece of hair that is CLOSEST to Gokus back. I've seen some online reviews where the reviewers express frustration at the hair not being able to be placed on the support stick properly when this should not be the case. I myself have had the support stick used with Goku since I got him 2 weeks ago and his hair stays on it just fine. (If you put the stick in the proper place, the figure can even stand with no base!) This is what I mean by putting the support stick in the right area. One thing I would have liked for Banpresto to have done would have been to allow the hair to "lock" or "click" into a socket for a maximum firm connection. But the support stick uses the weight of the figure itself and the friction of the plastic of the hair and the plastic of the stick to stop the hair from moving and also to double as a reinforcement support post. All in all the base is thin, sleek and gets it's job done. Here we come to the pose, not much to say about it here as the pose is pretty static. Not really doing much, just standing there with clenched fists. Luckily the sheer detail and awesomeness in the figure makes up for the lack of dynamism. He is posed standing upwards, slightly leaning back with a stern smirk on his face. To compare how well the SCultures SSJ3 model looks against others, I'll compare various images of the SSJ3 Gotenks and SSJ3 Max Muscle Mania models as well as the striking similarities to the Wild Style SSJ Goku released in 2010. (I actually had to dig the Wild Style and Gotenks out of Storage, the Max Muscle Mania I gave away to a friend). First off in the comparison block is the SSJ3 HQDX Gotenks. At the time, HQDX were pretty much the highest quality Dragon Ball DX figures on the figure market. That is until SCultures came along, and pretty much gave them a run for their money. Now since the HQDX line has been around for much longer then the SCultures line it has many more models and characters that have been produced as opposed to SCultures. Even so the SCultures model does not disappoint, shown to have detail surpassing the HQDX SSJ3 Gotenks and easily surpassing the Max Muscle Mania Goku. I really like the SSJ3 Gotenks model. It's of decent size, beautifully sculpted/painted and captures his likeness entirely. It's a really good representation of Gotenks in the SSJ3 form. SCultures SSJ3 Goku and Gotenks compliment each other in that the scale seems to be in range of one another, as well as the accurate and high quality sculpting on both models shining through upon viewing them side by side. Here we can see a front shot of both the HQDX SSJ3 Gotenks on the left and the SCultures SSJ3 Goku on the right. They look to be in scale with one another, both looking great. Shot of the characters standing back to back, here one can note the similarities in the hair styles as they each flow backwards from the head in layers. Also note the shiny white golden colour of Gotenks' hair versus the very dull blonde of the Goku. The hair on the Goku model adds more of a real undertone, but I wouldn't have minded it being more of a deeper golden yellow like the Gotenks. Another shot with both figures looking forward, looking great on both accounts. Here we see the figures from the back. Again notice the similarities in the hair design and overall structure. Both came out very well. Although the SCultures model has an overall better hair sculpt and structure, a little more vivid than the Gotenks model. I really like these shots because it shows one of my biggest discernment's between the two figures. The Goku has a more vivid and extravagant hair sculpt this is true and looks amazing... but the colouring is way too dark. It's most apparent in this photo, where the Gotenks' hair catches the light and shines nicely all over, the SCultures model looks dull and dirty. I really wish the hair would have been painted a more golden yellow on the SCultures model, I really do. This is just a shot showcasing the differences between the HQDX Box size and the SCultures box size, as you can see they are the same height, but the width is almost 2-3x larger than the HQDX box. Overall, the HQDX Gotenks is still an excellent model to have and the SCultures Goku only compliments it. They feed off of each other and look great on display together, really nice stuff. I no longer physically HAVE the Max Muscle Mania figure, so I'll just do photo comparisons one after the other. The MMM boasts a cartoonist face, unrealistically large bulging muscles protruding from almost orifice, coupled with hair that's charged back behind his head in a static array. 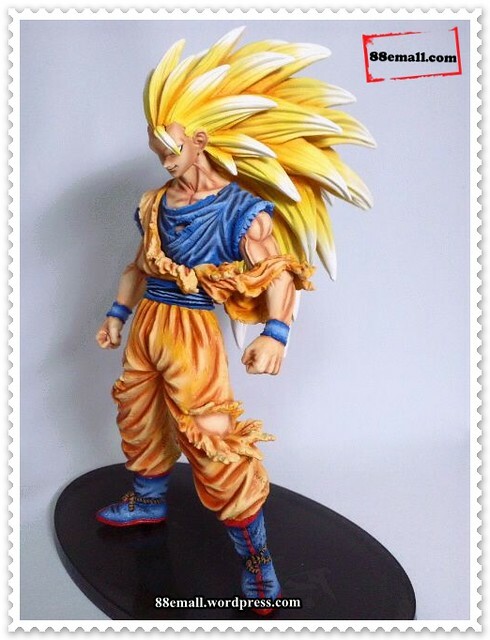 The SSJ3 SCultures model boasts a nice smooth realistic well sculpted face, a more reasonable muscle structure/tone, and wonderful flowing, beautifully sculpted hair. In essence the SSJ3 SCultures model delivers a more humanistic touch and overall presents itself better than it's MMM predecessor could. View spoilerHide spoilerThe SSJ3 SCultures model also shares large design similarities to the Wild Style SSJ Goku model as I will now show you. The similarities really fall to the clothing and the style in which it's presented. Here you can see both figures share the same design in terms of muscle structure, muscle tone, and even rips in the fabric of the clothes. Whereas the SSJ goku has his shirt ripped off exposing his chest, and the SSJ3 Goku has his outer gi ripped off exposing his undershirt. The overall colour pallet on the SSJ Goku is brighter and I really like the vibrant orange/golden yellow in his hair. 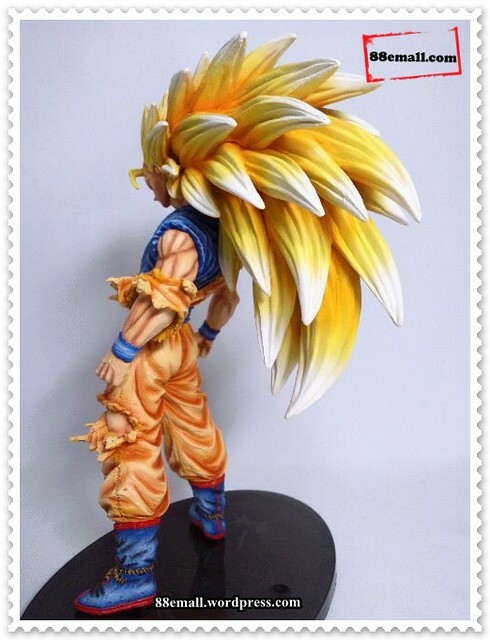 It really makes the hair on the SSJ model stand out. I wish the SCultures model has been painted as such. But through these photos you can see the similarities in clothing design (how the rips and singes seem to be almost mirror image identical). The sculpt on the Wild Style Goku is great as well with a lot of detail and attention put into the muscle structure and toning. Even on his back the muscle definition is off the charts! 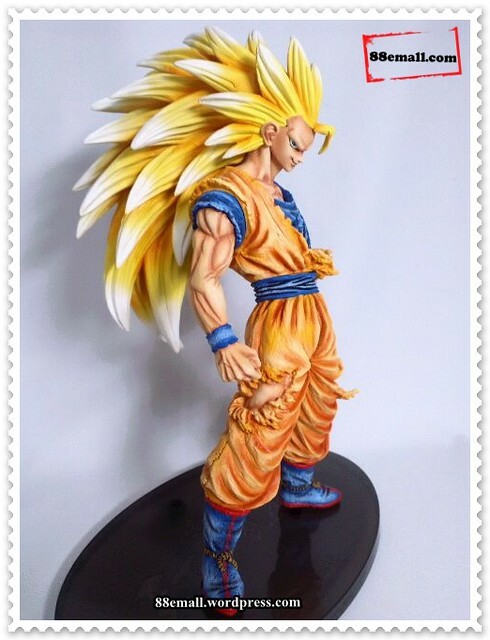 Again a very nice figure to compliment the SSJ3 SCultures model. My final thoughts on this figure are overall extremely positive. The figure shares almost the exact same presentation it has as it's prototype models, the only thing I don't like is the dull hair colour. In my opinion it should have brighter and more vibrant. The leaning is not even a problem, in fact it is something to be expected when the hair is so heavy. But as long as you have the support stick in the right place the figure will stand just fine. I give this figure a perfect 10 (regardless of legitimate flaws I have mentioned) I feel this figure is a real gem and something we've needed in the Dragon Ball market for a long time. Finally, a REAL DX scaled representation of Goku in his pinnacle SSJ3 form (canon). Wonderful stuff and a definite must buy, not just for any Dragon Ball fan, but just in general. Its a really nice piece. He's sold out at a lot of shops now. I believe a store that still has him in stock would be Aikoudo, running you about 2200 yen. Be prepared to pay a lot for shipping though as his hair is really heavy, driving the figure/box weight to 800g, almost 1kg! 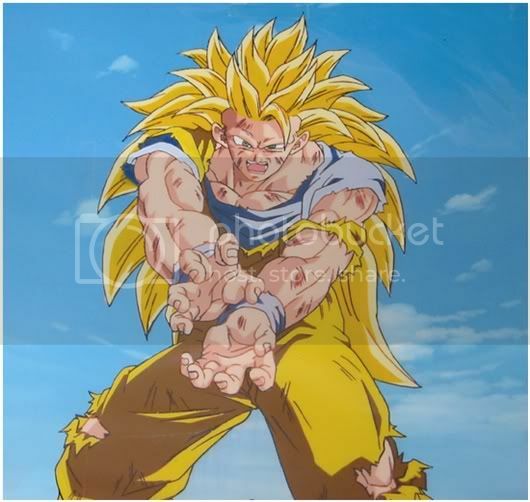 - First TRUE DX scaled representation of Goku in his SSJ3 form. - Overall colour pallet, (especially in the hair) is very dull, should have been lighter. (As shown in prototype images and the box art itself). And there's my review on the wonderful SSJ3 SCultures Super Saiyan 3 Son Gokou, I hope you enjoyed it!!! NessaPie23 (Vor 6 Jahren) #1244123WOW! First off I am new here and in the world of figure collecting, basically just browsing around the blog section and I found your post and may I say you have great attention to detail, when I first looked at the figure I was blown away at the overall, but the way you broke things down was great! I really understood and saw the flaws you mentioned, all I can say is thank you for this great review, it's making me pay more attention to detail when I look for figures to buy. WOW! First off I am new here and in the world of figure collecting, basically just browsing around the blog section and I found your post and may I say you have great attention to detail, when I first looked at the figure I was blown away at the overall, but the way you broke things down was great! I really understood and saw the flaws you mentioned, all I can say is thank you for this great review, it's making me pay more attention to detail when I look for figures to buy. If he had done the whole hairpiece in a solid yellow I'd say it'd be damn perfect! levithianSSJ3 is the most waited figure for me, and I am very happy with the overall product. Nice review Raithos, nice pics and nice comparison. I agree with you regarding the color of hair and the overall paint. but the figure still one of the best figures in 2011 and one of my favorites. I must get the damaged Goku too. SSJ3 is the most waited figure for me, and I am very happy with the overall product. Chibi_GohanNice review! I have to say that I agree with you in regards to the dull color, especially in the hair. It's still one of my favorite figures though and worth every penny. Yeah if the hair was more vibrant it would have made it perfect for me. Still an amazing piece and yeah worth every last cent, very affordable too. I like what Banpresto is doing pumping out large sized figures at affordable prices. Should have been this way all along, lol. Nice review! I have to say that I agree with you in regards to the dull color, especially in the hair. It's still one of my favorite figures though and worth every penny. EisenheimI meant about the static poses. I thought you weren't a fan of them before you cleared my doubts. I meant about the static poses. I thought you weren't a fan of them before you cleared my doubts.